Catalogue > Maps Europe > Russia. St. Petersburg. Palace Square. St. Petersburg: Delineatio alicuyus Spatii Petersburgi in Rusland. - Dibuxo d'una placa a Petersburg en Rusland. Old, antique print of the Palace Square in St Petersburg. 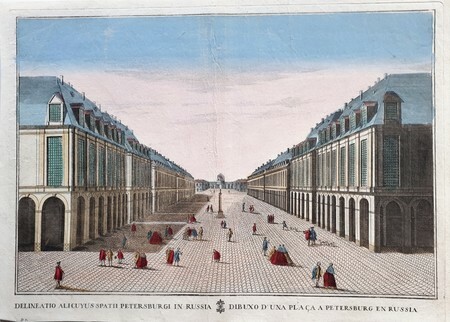 Remondini, around 1780. The Palace Square is a square in St. Petersburg that connects the Nevsky Prospekt with the Palace Bridge, which leads to the Vasilevsky Island. The square borders the Winter Palace and the Hermitage and is also the central square of the city and the former Russian Empire and was the scene of many world-famous events, such as Bloody Sunday in 1905 and the October Revolution of 1917. In the middle of the square is the Alexander Column, in honor of Tsar Alexander I. Height 30 cm., Width 41 cm.